Calender Mills was the most recent Streuver Brothers, Eccles and Rouse project, a joint venture between SBER and Armory Revival in one of the buildings. While 60 Valley Street is becomming the Plant (operated by Hall Kean Management and Puente with SBER as the general contractor), 50 and 52 Valley Street is residential units, with two commercial units along Valley Street. The project moved in two stages, with the street-front building being completed before the rear half along the river. Mostly gleaned from the Nat. Reg. 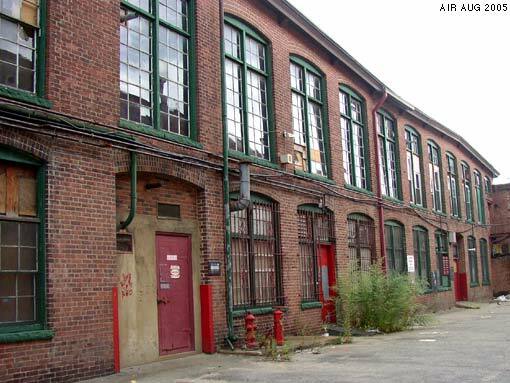 Nomination Form: The complex is made up of conjoined buildings built during different time periods, and right next door to the rest of the Providence Dyeing, Bleacing & Calendering Company. The main space on the site was home to the Antonelli Plating Company, an outfit that plated nickel belt buckles and jewelry components for 50 years. The building is single story with a large central monitor roof. Other smaller buildings are joined to it off the back and line the edge of the river. These buildings housed various support services for the PDB&C. Originally, the building was built for a company called the Atlantic Degras Company, which extracted oil for a leather process. The company was in business for 3 years before going out of business and selling to the PDB&C. The Atlantic Degras company was part owned by the leaders of the nearby Riverside Mill and the Atlantic Mill. The building at 50 Valley Street is a two story structre with arched windows and granite lintels. It was built seperate from the rest of the complex and housed offices for the managers of the plant as well as a filter house in the back used to filter chemicals used in the bleaching process. Veronica Baker According to my grandfather’s 1918 Draft Registration Card, he was a percher at Riverside Mills. His name was John Kudzma and he was born in Lithunia in 1877. I don’t know when he emigrated to the US. val My friend lives near this site now and all I can say is it’s very noisy and no fun to be living near, at least during renovation.